JAKARTA, Indonesia (AP) — The ailing 80-year-old radical cleric who inspired the Bali bombers and other violent extremists in Indonesia will be released from prison, Indonesia’s president said Friday, slashing a 15-year sentence. 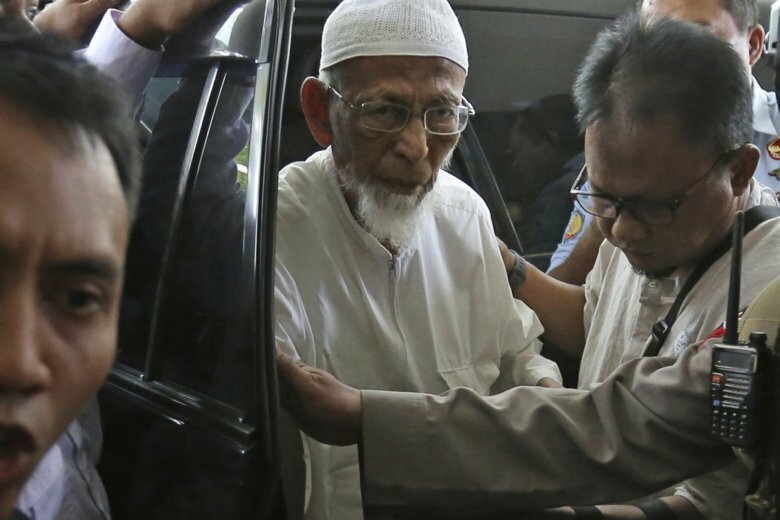 The announcement of Abu Bakar Bashir’s imminent release came during campaigning for a presidential election due in April in which opponents of President Joko Widodo have tried to discredit him as insufficiently Islamic. “Stunned that he is about to be released,” said Jan Laczynski, an Australian who lost five friends in the bombing of the Sari Club in Bali and narrowly avoided being at the venue himself. “Truly devastating news as effectively he gets on with his life whilst everyone else suffers from seeing him walk out of jail,” he said. Bashir’s lawyer, Muhammad Mahendradatta, said Bashir, who was sentenced and imprisoned in 2011, would be released within days. “We haven’t had the exact date of his release, but because Bashir badly needs serious health care the release will be carried out no later than next week,” he told The Associated Press. Mahendradatta said he wanted Bahir’s release to be without any conditions, enabling him to meet supporters and give sermons. The 2002 bombings were a turning point in Indonesia’s battle against violent extremists, making heavy security a norm in big cities and forging closer counterterrorism cooperation with the U.S. and Australia.